Our emotions are often affected by the weather. You may feel disappointed on a rainy summer’s day, but there is always the hope of sunshine and the long hours of daylight to keep the spirits up. The cold and dark of winter, on the other hand, can feel relentless and oppressive. Winter is also often a time of reflection. This can mean recounting happy times or dwelling on dreams or plans that have gone awry. It is hardly surprising, then, that many people experience a dip in mood during the winter months. 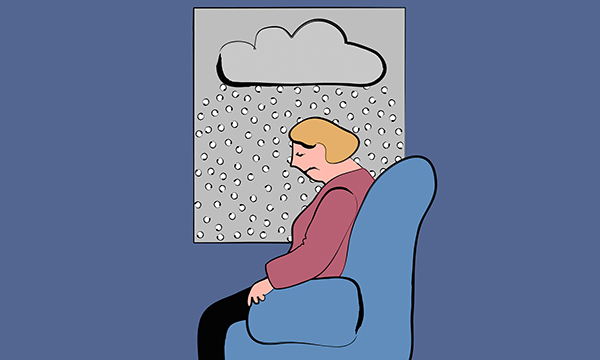 Though some variation throughout the year is normal, if you find that your mood becomes noticeably lower as the days get shorter you may be experiencing seasonal affective disorder (SAD). SAD is not simply a case of feeling fed up’, rather it is a form of depression that has a cyclical pattern, often recurring annually. Most people with SAD notice that their symptoms appear in the autumn and worsen in intensity in the winter months, feeling most severe during December, January and February. As well as a lowering of your mood you may notice other symptoms, such as losing interest in work and hobbies, feeling irritable and less able to cope with busy shifts, feeling you don’t belong, feeling exhausted all the time, even on your days off, being unable to switch off from the ward and other commitments, and craving starchy foods. When you have depression it is easy to judge yourself negatively against colleagues and friends. The social pressures of the festive season, combined with extra pressures on healthcare services in winter, can make coping even harder. Depression can feel isolating, and though it may be tempting to use alcohol, nicotine or other substances to try to take the edge off how you are feeling, these aren’t long-term solutions. Whatever you are feeling now, you don’t need to go through this on your own. Just like other types of depression, SAD is treatable, often with a combination of light therapy, anti-depressant medications, lifestyle changes such as diet and exercise, and talking therapies. Taking a pro-active approach can help you feel more in control. The first steps are to recognise how you are feeling and let someone know if your mood is slipping. Don’t berate yourself. SAD is nothing to be ashamed of and it is not your fault. Remember that having compassion for yourself as well as those you care for is a vital part of mental wellbeing.